Traditionally, when one thinks of Italy, usually historical and architectural sights come to mind. "Italy has more than thirty UNESCO World Heritage Sites and stands at the top of the international list, recognized as the country with the highest number of sites of cultural importance," says author Nicola Lancaster. When asked to name famous "things" from Italy, it's hard to stop rattling off answers. For example, the Colosseum, the Leaning Tower of Pisa, the Vatican, olive oil, pasta, tomatoes, gelati, Florence, Milan, Verona, Sicily, Naples, Mt. Vesuvius, Pompeii, tiramisu, Parmesan cheese, Chianti, ceramics, opera, Verdi, Puccini, Mt. Etna, Capri, Lake Como, Tuscany, truffles, the Statue of David, the Pope, Piazza San Marco, gondolas, the Ponte Vecchio, the Sistine Chapel, Sophia Loren, Gucci, pizza, Lamborghini, Venice, pesto, Fiat, La Dolce Vita, and ciao! Need I say more? Italy is one of my favorite countries, per the above examples, and I've been to quite a few places - all of which I fondly recall. This book captures all that is Italy - food, architecture, landmarks, history, art, and light and reflections among others - with breathtakingly beautiful photographs. If you've ever been to Italy, some of these pictures will bring tears to your eyes they are so stunning. There is so much more to this wondrous country and so much of it is captured on these pages. 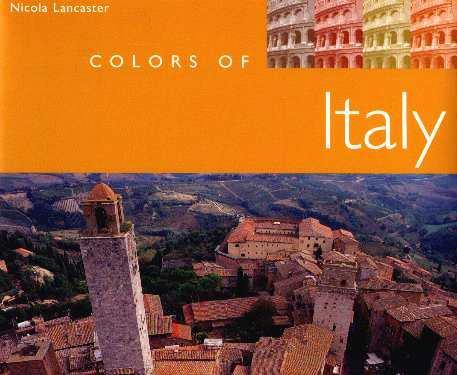 Colors of Italy may be purchased and/or ordered through your local bookstore. Conclusion - This book is a thing of beauty.